Water (eau), Butylene Glycol, PEG-4, Polysorbate 20, Parfum, Oleth-30, Methylparaben, Sodium Chloride, Propylparaben, Disodium EDTA, Ceteth-15, Benzalkonium Chloride, Glycereth-26, Glycerin, Citrus Limon (Lemon) Fruit Extract, Choleth-15, Ascorbyl, Palmitate, Sodium Hydroxide. This is a newer toner for me and the one I am currently using right now. It is different, had a nice smell to it. As of right now it doesnt seem to be drying out my skin which is a bonus for me. I would defiantly recommend this toner if you are looking for a cost friendly, skin care product to use. I'm in love with this toner, it does wonders for my combination skin and when I'm not testing products it's become part of my 'go-to' routine. I have something embarrassing to admit. I've been using toner for years (the same type I might add) and never knew what it did. Out of the interest of testing this well, I did a quick google. Turns out toner is supposed to remove trace amounts of cleanser, rebalance PH of your skin and make your pores shrink. I can easily say that the toner I've used for years did precisely 0 of those. So onto this toner. I've found my dream skincare routine and it definitely includes this toner (as well as the Clean and Clear exfoliating slices and Loreal Revitalift vitamin C serum!). On my initial use of it, I noticed my skin was so much softer than usual, but didn't want to jump to conclusions. Well, after using it for a week and a half I can easily say that my love affair with this toner continues. I've always been self-conscious about the big pores on my nose and cheeks and within a couple of days they were so tiny! On top of that, I rarely break out anymore, my skin quality has risen massively and it just feels great. My husband has terribly dry skin and I tried this on him too, just out of curiosity. His skin didn't get perfect for me, but there was a big improvement! Using the toner is nice too, it smells zesty and refreshing and feels cool and comfortable on my skin. I have one medium sized complaint that I really, really hope Clean and Clear sees and fixes. The bottle is terrible. This toner does not deserve this bottle. Not only is the bottle so difficult to get open that I hurt myself and still struggle to open it every day (even my husband struggled to get it open! ), but it's difficult to get a steady flow and if you squeeze too much comes out. The secret is to just tilt it really high, but I mean...this toner deserves a bottle as awesome as it is. Please fix the bottle, Clean and Clear!!! Thanks for sharing your review! We appreciate your feedback on our bottle and we'd like to speak with you to hear more. Please give us a call at 1-877-754-6411, M-F 9am to 5:30pm ET. We hope to speak with you soon! How amazing does this feel on my face?! My friend had me tru hers and I fell in love. Makes your face feel amazing and it smells even better. I use it once a day before I go to bed to get all the excess oils off my face. Smells so lemony fresh and helps remove more dirt that the cleanser didnt take off. Its a bit drying for my sensitive skin so I use it with hydraulic drops and lotion. This toner has a nice lemony scent to it. I had slight reaction to it the first times I used it. It might have been too harsh for my skin. I also found it quite drying. I think I might save this for the summer and see if itll be better when my skin tends to be more oily. 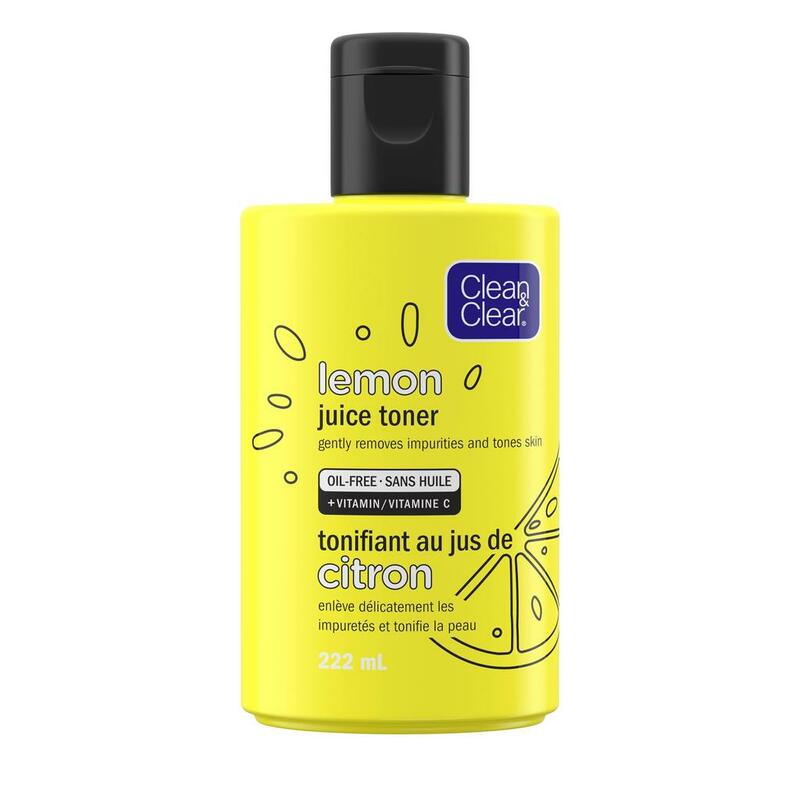 The clean and clear lemon juice toner has a good scent. I have used a couple of times, but I have liked it. Unfortunately I have reactions to lemon, so my husband stepped in to use the products and review them for me. So here's how this worked from his perspective! Being lazy with his skincare, he was pretty excited to find out both this and the lemon wipes could be used without rinsing. He did question if the toner was a necessary step, seeing as how it says it cleans the skin just like the wipes and scrub. Like with the other items in the line, he loves the scent. He has slightly sensitive skin, but did not notice any burning or redness. Honestly, he barely noticed anything aside from it being a bit drying. He felt the scrub and wipes worked better at cleansing and brightening. His least favorite of the bunch.